Say hello to your favorite new work, school, travel and just plain everyday healthy snack! 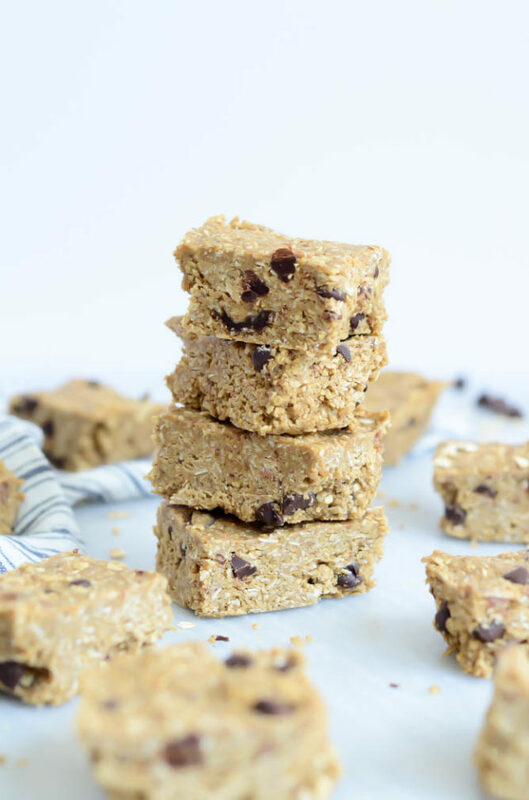 These Chocolate Chip-Sunflower Seed Butter Protein Bars have been a total game-changer for me and I’m preeeeetty sure they will be the same for you. 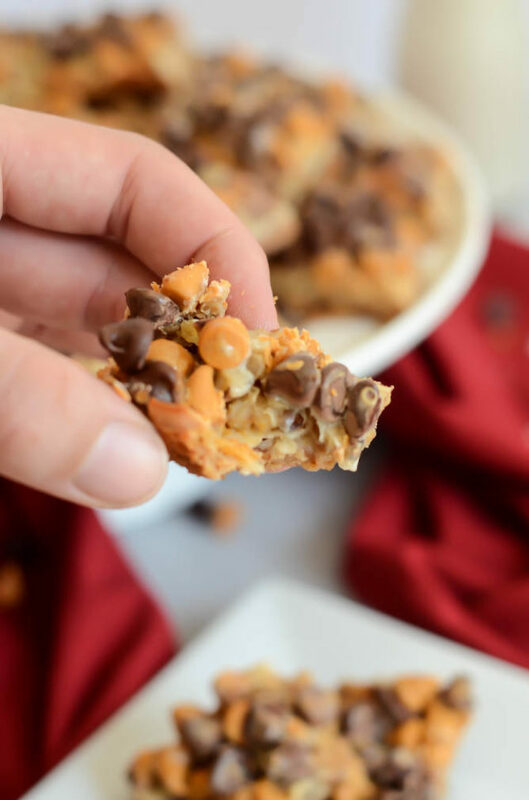 Anything that is filled with protein and whole grains yet tastes like dessert is a winner in my book, plus they’re so easy to grab and go you really can enjoy them anywhere you are, at any time of day. Remember when I made these Homemade Whole Wheat Crackers and went on and on about how I’ve always aspired to make all of my foods from scratch rather than buying the pre-made, preservative-laden stuff at the store? 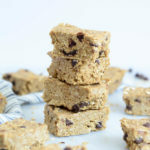 These Chocolate Chip-Sunflower Seed Butter Protein Bars also fall under that “totally-easy-stuff-I-can-make-at-home” category. Really, they’re made with ingredients that you should already have on hand in your pantry (maybe save for the sunflower seed butter, but you can find that at any Whole Foods or Trader Joe’s) and require NO baking. That’s right, just a little bit of time in the freezer to set up and you’ll be stocked with healthy, filling Chocolate Chip-Sunflower Seed Butter Protein Bars for days to come! I think it’s also very important to mention that these bars are both gluten-free (if you use gluten-free oats) AND nut-free, which means just about anyone can enjoy them. (Sorry if you’re allergic to chocolate, but you could always just leave out the chocolate chips!) And let me tell you, that sunflower seed butter is legit and will not make you miss peanut butter or any other sort of nut butter at all. Promise. 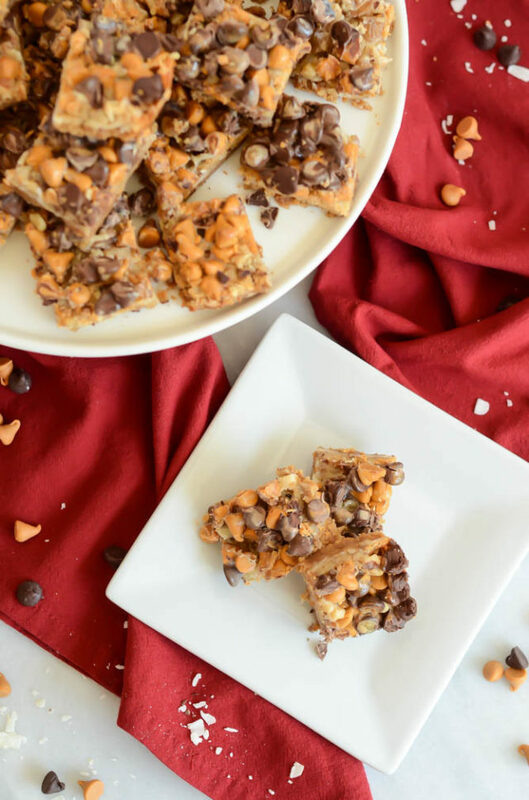 So I bet by now you’re wondering, what all goes into these uber-delicious Chocolate Chip-Sunflower Seed Butter Protein Bars? Let me tell you – just seven ingredients! Seriously, guys, I don’t think I could have made this any easier for you. We’re talking rolled oats, dates, honey, coconut oil, sunflower seed butter, chocolate chips and vanilla extract. That’s it! 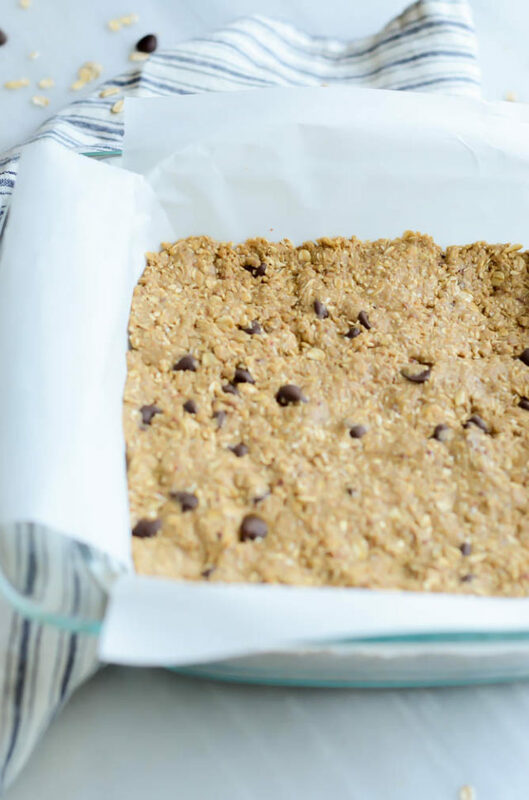 So many nutrient-packed ingredients all packed into one little bar. That’s my kind of snack/breakfast/late-night nosh. 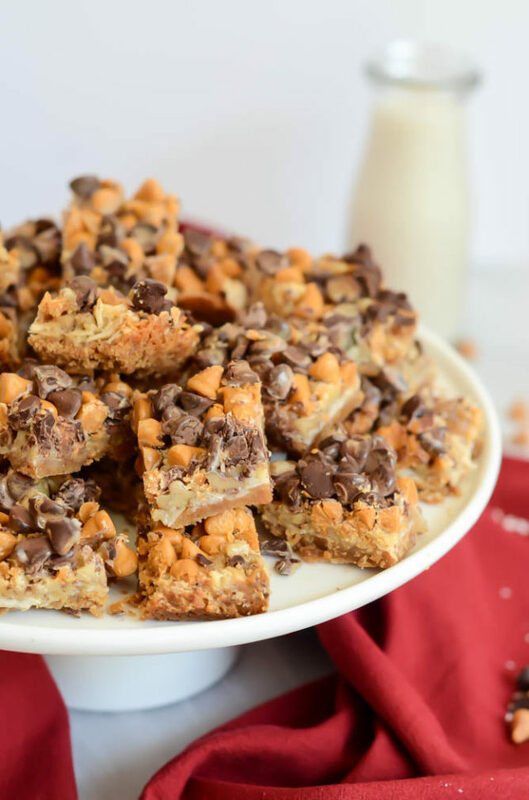 We take all of the ingredients (save for the chocolate chips) and throw them into a food processor, where we pulse until a crumbly dough-like texture forms. The next step is to line an 8×8-inch baking pan with parchment paper and press the mixture in nice and tight. 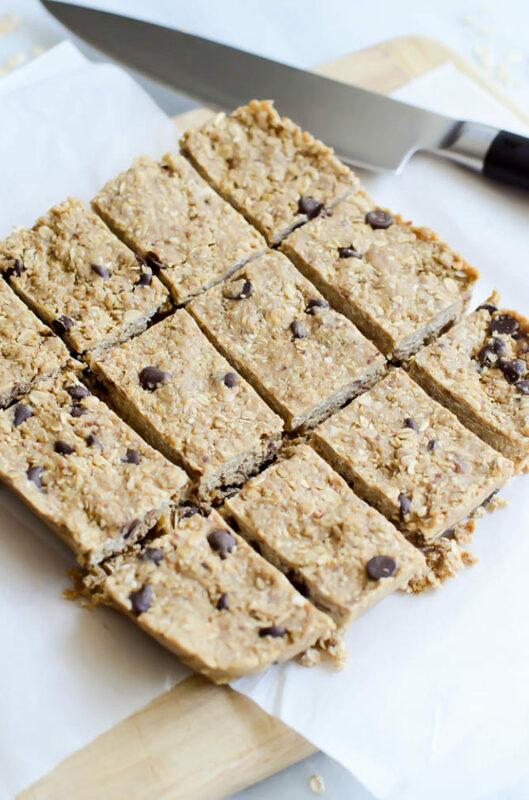 A one-hour turn in the freezer and your Chocolate Chip-Sunflower Seed Butter Protein Bars are ready to be cut and consumed! 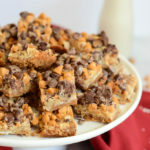 One important recipe note: Since I tried to use as whole ingredients as possible in these bars, they do turn a bit crumbly after they’ve been out of the freezer for a while. I’ve found that the best technique is to slice the bars after the initial freeze, then wrap them individually and keep them back in the freezer for storage. I may be the only weirdo that does this, but I actually really like munching on the bars straight out of the freezer. 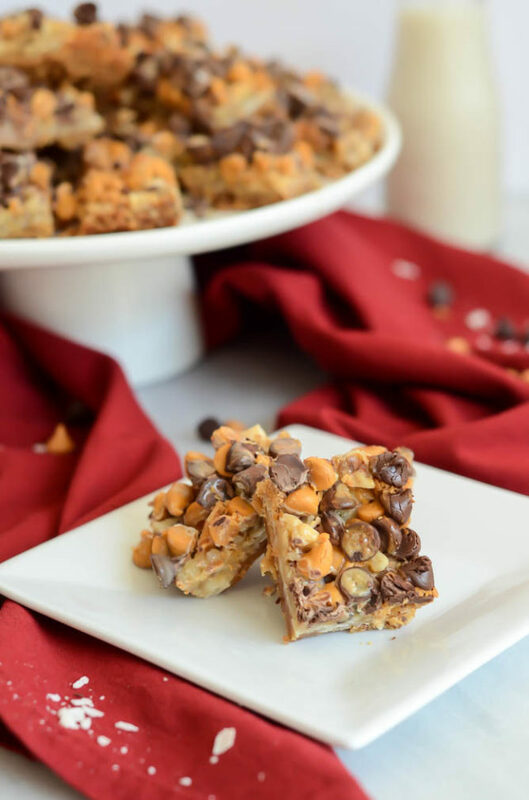 However, if you are packing them to-go for work or as a travel snack, just be prepared that they may get a little crumbly as they come to room temperature. Don’t worry, they still taste fantastic! 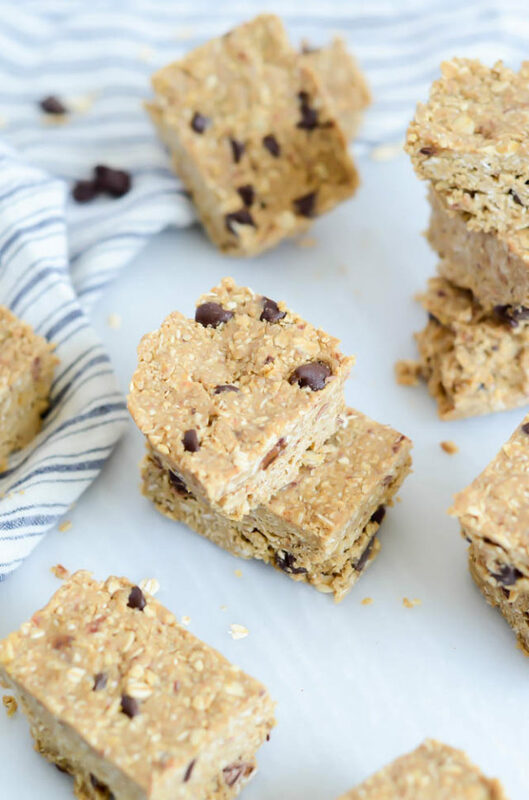 Basically, you should go whip up a batch of these Chocolate Chip-Sunflower Seed Butter Protein Bars ASAP so you have them on hand to get you through the rest of the week. There’s nothing like a couple of good ol’ bites of healthiness to give you the power to get through the day! 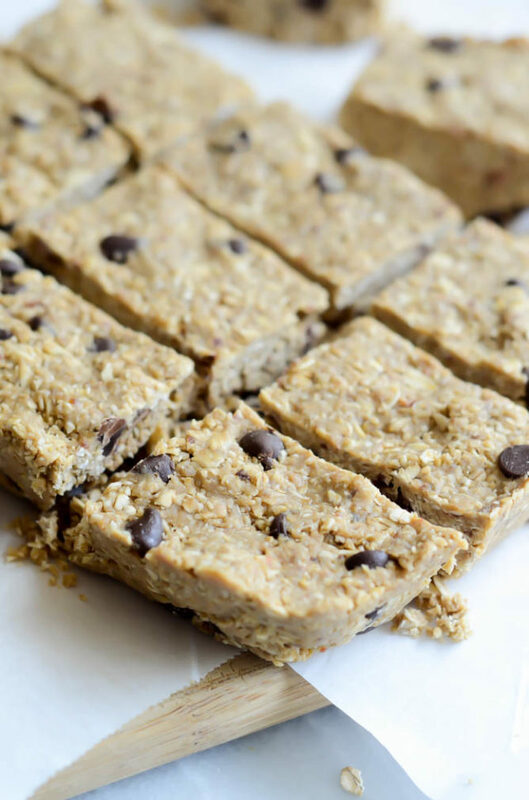 These nutrient-packed protein bars are full of filling oats, sunflower seed butter and a touch of chocolate. Plus they're gluten- and nut-free! 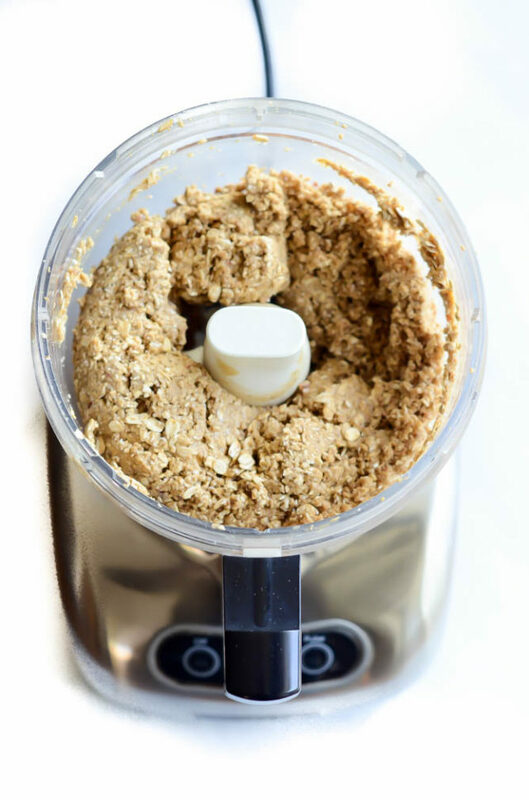 Combine rolled oats, pitted dates, sunflower seed butter, honey, coconut oil and vanilla in a food processor. Pulse until a crumbly dough forms. 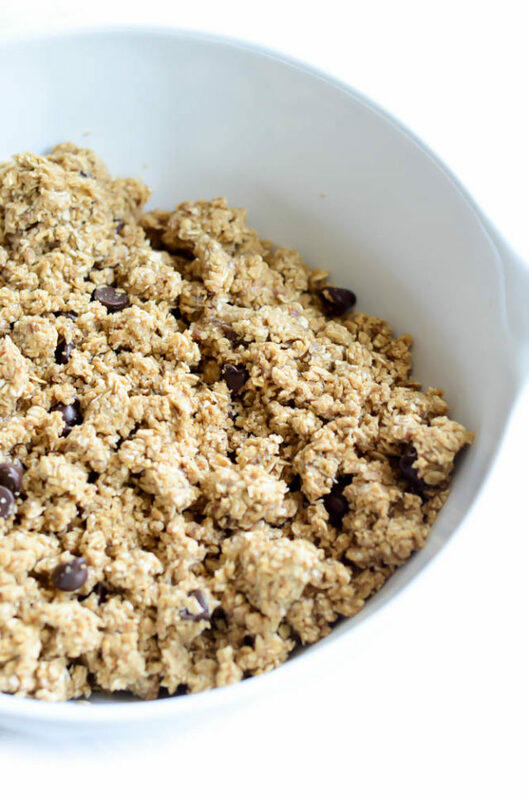 Transfer dough to a mixing bowl and, using a wooden spoon or your hands, mix in the chocolate chips. Line an 8x8-inch glass or metal baking dish with parchment paper, leaving a little extra hanging off the sides to make it easy to pull the bars out once they are set. Transfer dough to the prepared baking dish and press it in tightly with your fingers. Place in freezer for at least one hour. Remove from freezer and, using the parchment paper, remove the bars from the pan. Using a sharp knife, cut the bars into 12 pieces. For best results, wrap each bar individually in plastic wrap or wax paper and store in the freezer until ready to eat.